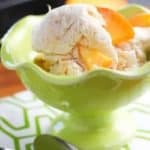 Fresh and Light Peach Ice Cream – is there anything better than homemade ice cream on a hot summer day? This recipe is from an old Cooking Light magazine I had hanging around. It uses whole milk and half and half instead of heavy cream. No precooking makes it a breeze! There is a slight difference in constancy…not quite as smooth as full ice cream but the reduction in fat and the fresh flavor have you not even noticing. You can substitute any kind of fruit for the peaches of course. Strawberries would be divine and I was even considering pineapple and coconut. My ice cream maker of choice is the ice cream maker attachment for my Kitchen Aid. I have used several of the ‘frozen bowl’ type ice cream makers and this one is by far the best. The bowl stays cold long enough to get the ice cream frozen – kind of a prerequisite for an ‘ice cream maker’ dontcha think? Photography note: I have no idea why I used a lime green bowl for peach ice cream – but it does kinda pop – just looks like lime ice cream with peaches on it! 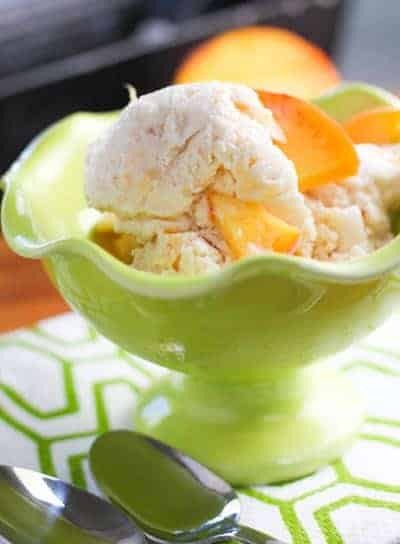 Always learning…..
Fresh and Light Peach Ice Cream - is there anything better than homemade ice cream on a hot summer day? Finely chop the peaches. Combine peaches and remaining ingredients in a large bowl. Pour peach mixture into the freezer can of an ice-cream freezer; freeze according to manufacturer's instructions. Spoon ice cream into a freezer-safe container; cover and freeze for 2 hours or until firm. I have been wanting to make a peach ice cream! This sounds delicious. And love that it is lower in fat. Ice cream without the guilt!